James Dietz Handsigned and Numbered Limited Edition Print:"The Legacy Continues"
Size: 17 1/2" x 25"
About the Art: Events in 1989 brought about the collapse of the Iron Curtain, rippled throughout the world and brought dramatic changes. The downsizing of the United States military was one of the byproducts. During this period of reorganization, the Chief of Staff of the Army made the decision to move the 1st Infantry Division from Fort Riley, Kansas to W�rzburg, Germany, and the 3rd Infantry Division from Germany to Ft. Stewart, Georgia. These two great Divisions stand together among the most honored units in our nation's history. Both of them were part of the WWI expeditionary force under General John J. (Blackjack) Pershing. The "Fighting First" led the way overseas, saw the first combat, and marched first into Germany. General Pershing called the 1st Infantry Division the "best damned division in any army in the world." The "Rock of the Marne" earned its name during these same campaigns when surrounding units retreated while the 3rd Infantry Division remained immovable in battles along the Marne River in 1917. General Pershing called the 3rd Division's performance one of the most brilliant pages of our military annals. Both divisions would carry this fighting tradition into World War II. The 1st Infantry Division again distinguished itself as the first to strike in North Africa and Sicily, and the first onto the beaches of Normandy on D-Day. The 3rd Infantry Division became renowned as the only U.S. fighting force to sustain 531 continuous days of combat ranging from Casablanca to Salzburg, earning a Presidential Unit Citation in the battle of Colmar. The 3ID was also the home of the most decorated soldier of World War II, Audie Murphy. The Korean War continued the legacy of the 3rd Infantry Division with 10 battle stars, and another nickname as the "Fire Brigade." The Vietnam war had the 1st Infantry Division again return to combat. For the next 5 years "Big Red One" soldiers took part in 11 different campaigns. Later they deployed on Operation Desert Shield and Desert Storm and led the way through the berms and minefields for the 7th U.S. Corps' thrust into Iraq. The 3rd Infantry Division's 3rd Brigade also saw combat in Desert Storm advancing as the tip of the spear for the 1st Armored Division's deep thrust into Iraq on the left flank of VII Corps. 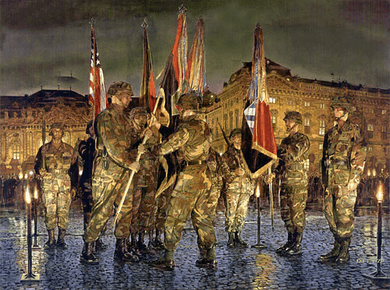 April 10, 1996 formally marks the day when the 1st Infantry Division headquarters returns to Europe. The ceremony itself took place in front of the W�rzburg Resident, one of the most historic buildings in Germany. The location provided a fitting place for the exchange of division colors of two of the most historic units in the United Stales Army for after WWII, the 1st Division alone remained in Germany. MG Meigs (the 3ID Commander and new 1ID Commander receiving the 1ID colors), LTG Abrams (the V Corps Commander who is passing the 1ID colors), MG House (the 1ID Commander from Fort Riley who just presented his colors to LTG Abrams), CSM Beck (V Corps CSM ), and CSM Gales (3ID CSM) participated in the ceremony. The 1st Infantry Division will continue to lead the way as a forward deployed division in USAREUR and as a committed part of NATO. At the time of this historic ceremony, the Division had units deployed to Macedonia, Bosnia and Hungary as part of the NATO peacekeeping efforts. The 1st Infantry Division looks forward to leading the way in training and readiness. It will carry forward the legacy of a great Division, tested so many times in battle by those who paid the ultimate price for "Victory."